I was shopping in earth-friendly organic clothes retailer Howies on Carnaby Street store and came across this small pocket sized fold out leaflet titled, in green, ‘DO Lectures'. That was enough to catch this eco blogger's eyes. 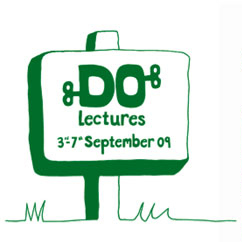 The DO Lectures, I read, work on the theory that ‘people don't forget stories, they forget facts' in the hope that hearing other's journeys of ‘doing good things' will give us the tools and desire to change the things we care about. The talks are given away free online at www.TheDoLectures.co.uk or you can book a place at the Do Lectures Event in West Wales, being held from the 3rd to the 7th of September. A £1,000 ticket will get you a place to stay at the magical Fforest farm, all your food and drink, accommodation, workshops, canoe rides and musical entertainments in the eves... oh and of course 20 talks given by 20 amazing doers. This year's doers include Patrick Holden (director of Soil Association) Paul Deegan (moutaineer who brings people's rubbish back from Everest) Gregor MacLennan (Campaigner for Amazonian peoples' rights), and Gerald Miles (Organic Farmer & GM Activist). All it's letters do something. It's the rapids of a river. The bubbles in a lemonade. It's a small word but does more than almost any other word. It means the same thing all over the world. It's most effective when it's got a plan. It's a word for getting things done.